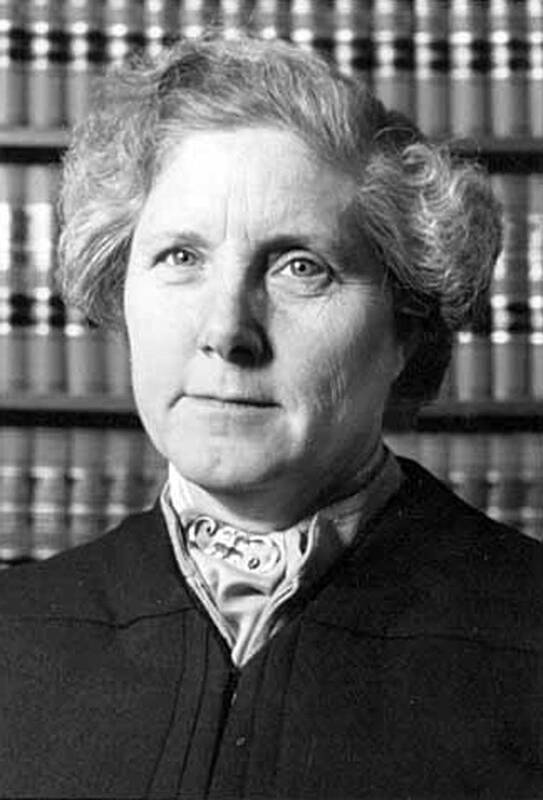 Rosalie Wahl grew from Quaker roots in Kansas, her early life punctuated by loss, to become the first woman to serve on the Minnesota Supreme Court. She died Monday at 88. While she will be remembered first and foremost as Minnesota's first woman to serve on the state Supreme Court, her time as justice was only a part of an extraordinary life. At 3 years old, when Rosalie Wahl's mother died, she and her little brother went to live with their grandparents on a 160-acre farm of rolling Kansas pastureland. At 7, her grandfather and little brother were killed by a train. Her grandmother had to sell the farm. To cope with the losses, she threw herself into reading books and writing. She became a staunch advocate for justice. During the mid-1940s while attending the University of Kansas, she co-founded an on-campus interracial housing co-op. She married and moved to Minnesota, where she had four children. While in her late 30s, she enrolled at William Mitchell College of Law. William Mitchell law professor and former dean Doug Heidenreich remembered teaching a class to Wahl, one-on-one, in the early 1960s. Wahl had to make up a class she'd missed while giving birth to her fifth child. "We had an individual class like you and me are talking now — and that was always delightful — and we would have tea," he said. Wahl remembered the same class. "He didn't know I was going to be on the court. He just knew I was a poor woman with a lot of children who needed help," said Wahl. "I sat across from him at his desk in the dean's office over a pot of tea and he taught me sales, and if I didn't know the answer, there wasn't anybody who did." Rosalie Wahl went on to establish the school's clinical program, which became a national model, and later paved the way for women to reach the state's highest echelon of legal achievement: The Minnesota Supreme Court. Wahl and a handful of women who graduated from law school quickly discovered they could not get jobs regardless of their talent. Law firms just did not hire women as lawyers, according to C. Paul Jones, another of Wahl's professors. Jones, however, did. He hired Wahl and other women graduates to work in the newly formed state public defender's office. Three women attorneys split two full-time positions so they could have time to care for their small children. "Women were still not being accepted based on their ability, as distinguished from 'We don't have any women in our law office.' So we took advantage of it in the sense that we got real high-quality [female lawyers] that would not have otherwise been available to us," said Jones. By working in the public defender's office, Wahl gained valuable experience arguing appeals before the state Supreme Court. She argued more than 100 cases, sometimes two or three a day. She earned a reputation as a strong advocate for the poor, people of color, and those disenfranchised from societal power. Wahl used to say that she viewed the justice system from the bottom up. "It's come back to me so many times and I've said to myself, 'I understand, I understand what Rosalie was saying' that it's vitally important that we are aware when we ourselves are exercising authority that it be exercised with caution and with prudence. [It was] such a powerful lesson," she said. Huspeni later served as a judge on the Minnesota Court of Appeals. In 1977, Minnesota Gov. Rudy Perpich looked to appoint the first woman Supreme Court justice. He looked to Wahl because she was smart, dedicated and she brought experience to the bench that none of the other justices had at the time: criminal defense. Wahl's friend and later colleague on the Supreme Court, Esther Tomljanovich, says Perpich knew that even after he appointed Wahl, Wahl's position was far from secure. Justices must run for election to retain their seats and it was inevitable she'd face challengers, even at a time when judicial incumbents rarely saw opposition. Tomljanovich says Perpich thought Wahl's strong base of support meant she could withstand a bitter election challenge. "He knew that was coming and he told me at the time that was coming," Tomljanovich said. "That was one of the reasons he chose her is because she would have a really good campaign and a lot of backers who were really passionate about her." The governor's predictions were correct. Five men challenged Wahl for her seat on the state's highest court. She defeated them all and served on Minnesota's Supreme Court for 17 years. On the bench she took the position that Minnesota's Constitution was not a carbon copy of the U.S. Constitution, even in areas where the language was identical. She believed Minnesota's Constitution had a distinct history and therefore its own meaning. But she would later say that she was most proud of her work in creating Supreme Court task forces on racial discrimination and gender discrimination. Minnesota Supreme Court Justice Alan Page said Wahl opened the door for people traditionally marginalized by the legal system to serve on the court. "She was very much instrumental in ensuring opportunity of access for women and people of color as judges, but also with her work on the committee that looked into gender bias and racial bias in our judicial system," Page said. "She was all about ensuring fairness for everyone and access for everyone." Page said Wahl combined a sharp legal mind with a sense of compassion. "I can remember sitting in the conference room with her and listening to her articulate her view of a particular case and it was always instructional informational and helpful," Page said. "She did it with grace, but at the same time, when she needed to be tough, she could be tough." Wahl retired in 1994. And while she was active in numerous organizations, she spent much of her time enjoying her Lake Elmo home surrounded by tall trees. In 2006, a group of friends and admirers commissioned a portrait of Rosalie Wahl to hang permanently at the William Mitchell law school. For the woman who had never thought of herself as portrait material, she said it was good for students to have visible role models. "When I went to law school, I'd sit in the library and down at the end, they had a portrait. And the portrait was of John Sanborn, who was maybe a graduate way back when. He was a judge of the 8th Circuit, I think," she said. "I never saw a woman judge. I never had a chance to practice in front of one." "Here I have lived. / Here let me die. / By yonder Birch Creek let me lie. / Birch leaves drifting on the sands / where I built castles with my hands in youth / and listened to the call, / Meadowlarks on grass tall. / Black-oaked horizons, skies above, / bound for me this land I love. / Birch Creek. Within your heart I lie./ As long as you live, / so shall I." From 2008-08, the Minnesota Historical Society held a film competition based on the lives of Minnesota's "Greatest Generation." One of the competition's winning films told the story of Rosalie Wahl.